This was a fantastic way to see Bangkok. We traveled through the backstreets and sampled some great local food. Our guides Lily and Ming were extremely professional, kept us safe and were very friendly and informative. A must for anyone visiting Bangkok! 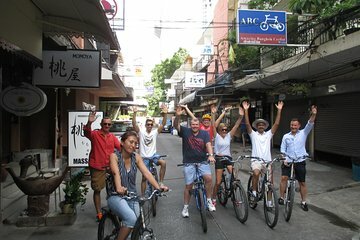 From city to the greens, our guide provided explanation and showing us a different Bangkok. We travelled to Thailand a few days before joining a tour of IndoChina and booked this ride to fill in a half day and see a bit more of the non-touristy parts of Bangkok and the surrounding countryside. There were only three of us on our session, my wife and I plus our guide, Aon I think I spelt that correctly. Aon took us on a ride through the backstreets of Bangkok where we got to see how the working Thais lived - quite an eyeopener. All our questions were answered openly and we got to understand a lot more about how people lived, both the good and bad aspects. We then took a ferry over to the Green Bangkok area where we cycled around on raised roads through the smallholdings. It was great to get clear of the city for a while and not have to breath traffic fumes. Plenty of wildlife, including large green spiders, and a welcome stop for a drink and snacks. Back on the ferry to the city and a short ride through the crazy traffic back to base. A great way to spend 4 hours or so to see a very different side to Bangkok with a truly excellent guide. Bikes were fine. Highly recommended.